Sharp LC-60LE452 is one good 60-inch HDTV out there at affordable price range. Quality and performance of this latest model from Sharp is reasonably good compared to other cheaper LED TVs available in market today. Our team took this hot selling HDTV for a comprehensive review because of positive reviews it has got from thousands of users. Watching HD quality movies on bigger screen really gives an amazing experience and this model does extremely well in bringing life to videos. Let’s have a closer look at its specifications and performance. 60-inch 1080P LED HDTV at affordable price range. Best quality of display with brilliant contrast ratio of 3 million : 1, which none of other LED TVs offer. Beautiful and slim design. The picture quality of this model was more than our expectations. There are very few 60-inch HDTVs available below $1000 and this model is way below that price with brilliant display quality. It’s amazing 3 million:1 dynamic contrast ratio with outstanding AQUOS 1080P LED display brings real-life look to videos. The picture quality was very good with clear crisp display and natural looking colors. The quality of display will surely keep your eyes glued to the screen. This HDTV is 3D ready and plays 3D movies with great quality. It has three HDMI input ports and one PC input for greater flexibility to play media files from different sources. This Sharp TV also has two built-in speakers with 8W+8W power output. The audio quality from in-built speakers was decent for a medium sized living room. This model has other few basic features what a HDTV should have, but outstanding picture quality with highest contrast ratio is the key advantage to be considered. This model is missing lots of features offered by other high priced 60-inch LED TVs we have reviewed earlier. This model doesn’t support Xbox, PSP3 and other gaming consoles. 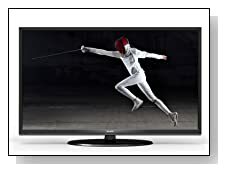 But it has everything to offer a best LED HDTV watching experience. Considering display quality, price and performance, Sharp LC-60LE452 is a best deal to consider. If you are looking for a best picture quality and good HD movies watching experience at a low budget, this HDTV is for you.